Cut, join, trim, mix, delete parts, split. Use Timeline for maximum precision and accuracy. Multichannel audio files are supported. Over 20 built-in effects and filters including delay, flanger, chorus, reverb, and more. Full support of VST effects and DirectX filters. Use specially designed filters to remove irritating sounds like "vuvuzelas", roars of football fans, hisses, etc. Blend several audio tracks, apply effects and save the output file in any popular format. Overlay your voice on audio while playing it back. 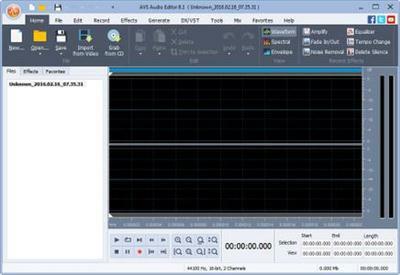 AVS Audio Editor is compatible with the latest version of Microsoft Windows. Select effects and settings and apply them to several audio files. Edit and save audio files in MP3, WAV, PCM, WMA, M4A, Flac, OGG, etc. Edit your audio recordings, apply effects, save them as separate audio files. Edit an audio file and save it to M4R format for iPhone. Make your Favorites panel. Select the most frequently used features and add them to your panel.